One way to feel empowered as an “everyday hero” is to practice modeling strong, resilient behavior doing the things that bring you joy and helping others find theirs, too. It’s really important to me to find things in life that bring me joy and to model that for my kids, not just as their mom, but as a woman. They can choose to be whatever they want in life with our emotional support, and I want them to feel proud of their accomplishments—the things they work really hard for. They should feel empowered AND they should understand the joy of being around someone else who feels empowered. I’m a mom who works full-time in corporate marketing for a large company; I’m lucky to love my job, the people with whom I work, and the brand. I also have side hustles that include this blog, Pursuit of It All, writing a novel and occasional freelance work—all of which I’m passionate about, even after a long workday. I give back by serving on the local American Advertising Federation board of directors, something I find personally enriching as well as beneficial for other creatives and marketers in the community. As a teenager in 2018, my daughter is wise to barriers many women face already, and chooses to blow past them with confidence and logic. Look out antiquated middle school dress code verbiage! I hope her drive never ever changes. My son, almost in double digits, is an innate empath (so much as I can tell this far into his life, anyway), and I want him to grow up encouraging the women in his life to be successful and happy. To know no boundaries. His natural tendencies swing that way already, and I can only hope that my own way of approaching life, along with the how I encourage his sister and other women in our lives, fosters it as he gets older. I’m empowered by feeling proud and independent. My self-worth isn’t dependent on others, but rather it clings to the joyful experiences I have and successes in life. I’ve found focusing on my own growth, rather than lose myself, is the key. I’m a better mom when I focus on my own needs just as much as the family’s. It feels counter-intuitive, but I promise you it’s not. Do I have a lot on my plate? Yes. But all the things I choose to take up my time are all things I’m proud of, that I enjoy doing, and that ultimately make me a better person. A few times a year I get away from the family. Alone. I visit my sister up in Brooklyn and spend long weekends devouring really good cheap eats around the city (doughnuts happen to be one fave) and binge some of our favorite TV shows, like Sherlock and Downton Abbey. I do impulsive things like chop off my hair or get my nose pierced because it’s always something I’ve wanted and, well, carpe diem! Plus, hair grows back. Once a year in fall, I spend a long weekend at a women’s retreat. It’s a time for me to rebuild, reflect and connect mentally with smart and funny females who are akin to a sisterhood. When I leave for a few days, I bid “Adieu!” to the kids with a big smile and hugs, waving enthusiastically. Will I miss them? No. Not really. Or, at least, not in the sense that I long to be home with them while I’m away. This “me time” thing is important, and I want them to know that. Getaways, while fun, aren’t always feasible financially or with our day-to-day schedule. So, I also make time for book club once a month. Sometimes I finish the book by the meeting, other times I don’t. But, regardless, I make our book club night a priority because it’s wonderful being surrounded by a diverse crop of women who enjoy a couple hours of intelligent conversation. We eat, we drink, we talk about the novel and we chat about other things in life! It’s a perfect, adulting way to spend a Monday night. The book club women have also gotten together outside of our regularly scheduled talk-about-the-book gatherings. We’ve prepped freezer meals for a pregnant member and we’ve visited The Book Thing to stock our shelves and donate a few books, too. It’s a fun group! I encourage my kids to be happy for me when I get a little time away by myself, and I make sure they understand the importance of me having time to cook and write (and how for me that’s not a chore, even if it seems that way to them). Is everything always perfect? Of course not. But I like to show the benefit of choosing positive intent, seeing the glass half full and not stressing over the small stuff—like something seemingly insignificant as a glass of spilled milk. I mean, hey. It’s just spilled milk. But it’s not “just spilled milk” to everyone. It can take practice to view life’s little mishaps that way, metaphorically or literally. Having the right tools on hand, like Brawny® Pick-a-Size 8 Giant Plus, certainly helps with a literal spilled milk situation. Brawny® paper towels offer more sheets on every roll (vs. leading national brand comparable roll and sheet size), which helps you clean up whatever life throws down and maintain that no-big-deal mindset so you can focus on bigger things. 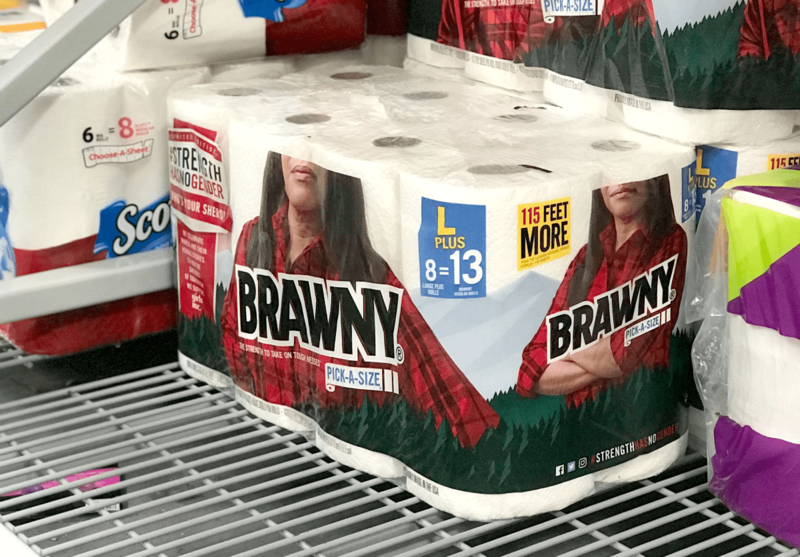 And, something to note, the Brawny® brand purpose is inspiring people to overcome life’s challenges with strength and resilience. I love that. A few years ago, I hiked the Dolly Sods Wilderness with my younger sister, husband and some friends when she turned thirty-years-old. I’d camped before, but nothing like this! Talk about strength and resilience… Minimalist campsites, lots of miles, and lots of laughs. My almost-forty-years-old body screamed at me by the end, but man, was it ever worth it. The views were majestic and the camaraderie was unmatched! I pushed harder than just about anything else I’ve ever done physically, yes, but more importantly, mentally. Even though I’m “Mom” to my kids, they understand that nurturing my “self” makes me a better mom. And, on the flip side, I want my kids to find the things that bring them joy. Growing up, our Mom was similar and it helped shape the women my sister and I are today. This is my SHEro story: raising another strong young lady and a son who understand the value of encouraging and supporting strong women. “What’s a ‘SHEro’?” you ask? A SHEro is a courageous, strong, selfless and resilient woman who has broken through with amazing actions, swooping in to save a stranger and standing up for what she believes is right. A SHEro is selfless and has a will that’s greater than her obstacles—a role model we aspire to be, not just facing adversity, but thriving in it. Not all heroes are a “he.” It’s time to recognize courageous, strong, and resilient women and hear their stories, too. This Women’s History Month, follow #StrengthHasNoGender to read stories of SHEroes, share your own story and encourage a friend to do the same. The Strength Has No Gender™ campaign highlights the inspirational stories of everyday women in cities across America who have been breaking down barriers in traditionally male-dominated industries and empowering others. GIRLS INC. PARTNERSHIP MODULE SHEROES OF TOMORROW: Brawny® will donate a $100K and will also give your SHEro stories to Girls Inc. to inspire girls to be strong, smart, and bold. Let’s shape a better future and prove #StrengthHasNoGender. Get your hands on Brawny® Pick-a-Size 8 Giant Plus, available at Walmart, limited-edition Strength Has No Gender™ pack.